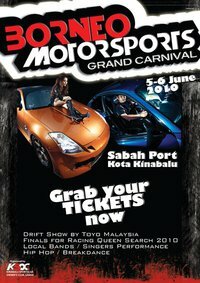 The first Borneo Motorsport Grand Carnival 2010. Book your ticket now for the most exciting event that u ever had~~!! Drifting performances, final for the Borneo Racing Queen,Autoshow competition, Band performance, Dancing, Lucky draw with surprising prizes & many more...Cancel all your planning during 5th & 6th of June for the most anticipating event of the year~~!!!!!!!!!!!!!!!!!!!! : Children below 3 feet gets free entrance. 10.00am - 12.00 pm	1. Registration of new members of KSOC. -1st round catwalk show by the finalists of Borneo Racing Queen 2010. 5.30 pm – 7.30 pm Performances by 4AG band. Singing and dancing show by invited performers. 2nd round of catwalk show by the finalists of Borneo Racing Queen 2010. 9.00 pm – 10.00pm	All participants and crew pack up and prepare for the final day. 10.00 am – 12.00 pm	1. Registration of new members of KSOC. 4.30 pm – 6.00 pm	-3rd and final round of catwalk show by the finalists of Borneo Racing Queen 2010. - Judging time for Borneo Racing Queen 2010. -Judging time for auto show participants. 7.00 pm	End of event! Book ur ticket now for the most exciting event that u ever had~~!! Presenting the stunts from the movie KL Drift 2, final for all the finalist of Racing Queen, Car competition n show off, Band performance, Dancing, Street Magician & many more...Cancel all ur planning during 5th & 6th of June for the most anticipating event of the year~~!